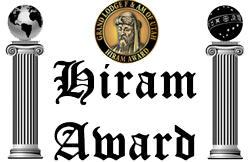 In 1983, Most Worshipful Brother Curtis N. Lancaster appointed a committee to develop a Hiram Award based on the program adopted by the Grand Lodge of California. The committee presented a set of rules, requirements, along with a certificate and pin design that were accepted by Grand Lodge in 1984. During 1984 the first awards were presented. This list of recipients was begun with the help of Ms. Marianne Ausseresses and Bro. William Hall, and by reviewing the Grand Lodge Annual Proceedings from 1983-2008. Any errors or omissions should be brought to the attention of the webmaster at the link below. * Not Listed in Annual Proceedings, Lodge has Documentation. Page 21 of the Grand Lodge Annual Proceedings (1986) mentions the Hiram Award, but the recipients are not listed. The following names and dates were discovered in the Grand Lodge Office. Page 19 of the Grand Lodge Annual Proceedings (1985) mentions that 6 awards were given, but no names are listed. A list of 7 names and dates was discovered in the Grand Lodge Office, and they are listed below. 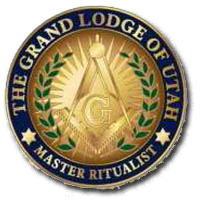 In 2009 Most Worshipful Brother Loyd E. Davis created an annual award to recognize Masonic researchers working on and publishing any aspect of the Craft in the state or territory of Utah. The award was first developed as a certificate, and later modified by Most Worshipful Brother Robert Chapman during 2011 as a plaque. The award is named in honor of John D. Prater, a scientist / inventor, who worked for Kennecott Copper Corporation and was a member of Kaibab Lodge No. 25. A recipient of the Hiram Award in 1997. 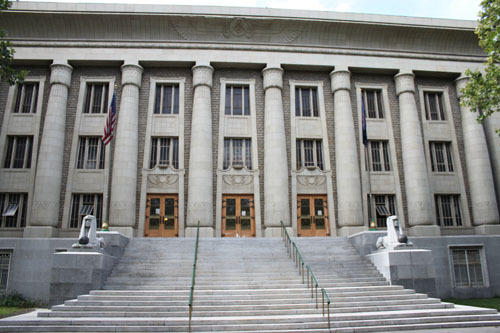 He worked on a number of historical research projects for the Grand Lodge of Utah. 1. 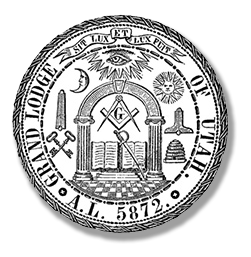 A member in good standing of any Lodge in this jurisdiction or of any Lodge of a jurisdiction recognized by the Grand Lodge of Utah. 2. Publish a book, research paper, educational feature or short talk on any subject related to Freemasonry. 3. The project must be well written, contain original material, relevant footnotes, endnotes or references. 4. 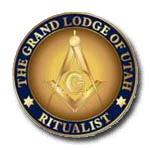 It is hoped that the author will allow for the project to be published through the Grand Lodge of Utah, or the Utah Masonic research Society. Though this is not a requirement for consideration. 5. Project should be submitted to the current Grand Historian for concideration. The primary purpose of The Master Builder Award Program is to encourage and recognize lodges in the planning, implementation and management of a well-rounded yearly program promoting lodge activities, brotherhood, charitable work, and involvement in their community. In order to be considered for The Master Builder Award, a lodge must submit an application form to the Grand Lodge Education Committee detailing their activities for the year. To confirm the applicationâ€™s accuracy and completeness, it must be reviewed and signed by the Worshipful Master and the lodge Secretary, with the lodge seal affixed. Documentation of activities may be included, if desired, but is not required. To receive the award, a lodge must meet the Mandatory Requirement, achieve five or more Major Standards, and achieve eight or more Basic Standards, for a total of fourteen accomplishments. Requirements are stated on the application form. Any questions should be directed to the Program Administrator, which is normally the Senior Grand Warden or other designee of the Grand Master. The Worshipful Master of each lodge should appoint a Master Builder Program Director for the lodge who will serve as the liaison between the lodge and the Grand Lodge Education Committee. This information will be communicated in writing by mailing the Program Director Letter to the Grand Lodge office at the beginning of the year.The Worshipful Master of each lodge should appoint a Master Builder Program Director for the lodge who will serve as the liaison between the lodge and the Grand Lodge Education Committee. This information will be communicated in writing by mailing the Program Director Letter to the Grand Lodge office at the beginning of the year. Lodges that earn the Master Builder Award will be recognized for their efforts and success during a special presentation at the annual communication. Lodges who become Master Builders for the first time will receive a plaque with the square and compasses, Grand Lodge name and Lodge name designating them as a Master Builder. Each successive year that a lodge becomes a Master Builder they will be presented with an attachment plate that hangs from the header plaque to represent all the years of distinction for the lodge. 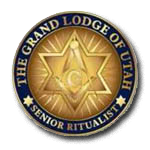 The primary intent of the Ritual Proficiency Program is to create a culture for the Lodges to be self sufficient in the Utah Standard Work. It has several other benefits including a form of recognition for all of the brethren in the craft, create a resource to assist the smaller Lodges, create a desire in new Masons to become proficient, prepare brethren for officer positions and help current Officers to become ready to move up the officer line and fill in when the need arises. There is no doubt that this program will provide many other benefits throughout this jurisdiction. The Masters of the Lodges should promote this program as a means to strengthen their Lodge. It should be encouraged among the newer members, not only to prepare them for future Officer Positions but to help create a sense of purpose and a real feeling that they are needed by the Lodge. It could help them begin the fulfilling journey into ritual work that so many of us enjoy. This program may also help with retention of members especially when the participating brethren are used to give lectures, to fill in when presiding officers are absent or to help with the coaching of newer members. By generating a positive atmosphere among the newer members, this could possibility increase their desire to become more active and to attract prospective members. The full list of points is on the down loadable form, basically, as you become proficient in the standard work and lectures, points are earned towards the three levels of proficiency. Pins are shown below. 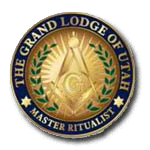 Earn 1600 points to receive the first pin, "The Ritualist"
Earning a minimum of 4800 points qualifies you as a "Master Ritualist"
The Grand Lodge of Masons of Utah is pleased to announce our "Masonic Rookie Award" as part of a focused commitment to membership engagement and getting our new members involved in their respective blue lodges. Eleven items must be accomplished, within the first year after being raised, to qualify to be nominated for the award. The Master Mason Rookie Award is an official means by which we can achieve these membership goals. 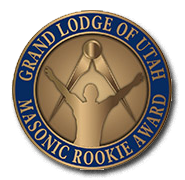 Attached is a checklist for the Master Mason Rookie Award. Once it has been completed and signed off by the Master of the lodge, it is to be submitted by the Lodge Secretary to the Grand Secretary and the Grand Master for his review and approval. Once approved, the recipient can receive his award (Grand Lodge Certificate signed by the Grand Master and affixed with the Grand Lodge seal and Master Mason Rookie Award lapel pin). The annual Masonic Youth Community Service Award award was created in 1997 by Grand Master David H. Nelson to recognize the bethel of Job's Daughters and the DeMolay chapter that best served their community in some act of service to the community. Each year the Grand Master grants this award to one bethel of Job's Daughters and one DeMolay chapter for outstanding service to the community for the preceding year. The prizes are a traveling trophy and a pizza party for the winning bethel or chapter, and the award is announced at their respective rally or conclave each year. Although all service and volunteer activity should be included in the application, that which was performed in our community will be given greater consideration than that which was performed within our Masonic family. To apply for this award, please click the link below.